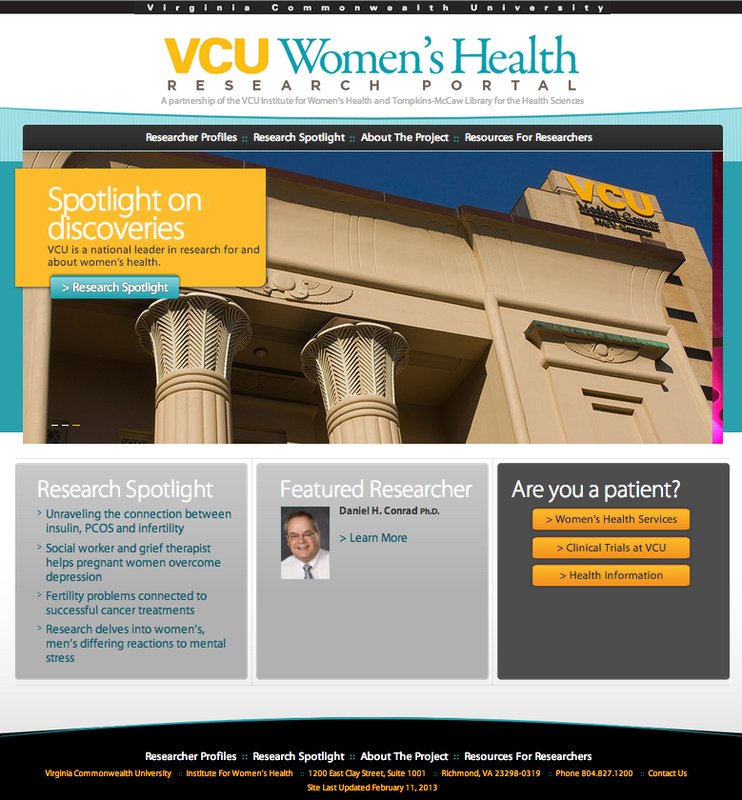 VCU Libraries got some press this week with the official launch of the Women’s health portal, built in cooperation with folks at the Institue for Women’s Health at VCU. I led the web portion of this project, working closely with 28 Media, a local web firm that did the WordPress theme design. The value of running interference: Depending on who you asked, there were 3 to 7 decision-makers for this project. Most of my work was running interference, communicating what our web firm would and wouldn’t be able to do to our project owners, and translating project owners’ requests into web-nerd language for the web firm. We were on an extremely tight timeline and scope creep was a big worry. In hindsight, this went fine. Grant project = you get what you’re paid for. This website and accompanying promotional materials were a grant project, which unfortunately limited the scope of what we could do with the site. We attempted to get original, fresh information on the site to provide a value-add for visitors. The site may just turn out to be brochureware for the university. Which is not an entirely bad thing. Hand it off explicitly. The project ended, the site was officially launched…then what? As a grant project owned by folks in several departments, there was (and is still) a chance this site may gather dust for eternity. Our communications director was very explicit about arranging a hand-off meeting with the stakeholders, figuring out the 5 W’s of the site maintenance. But time will tell on the site’s content. Updates for design and functionality are already on the list for my team. Within the next year we’ll need to update the branding to reflect the university’s new guidelines. I’m sure more changes remain to be seen.